President Barack Obama just returned from a visit to Poland, and the news reports are encouraging. He has thrown his support behind lifting the visa for Polish citizens who want to visit the U.S.A.
Chicago is long known to have the largest population of Poles of any city in the world after Warsaw, and these immigrants are also known to be working for low wages cleaning houses and doing construction and other jobs like their Mexican migrant-worker counterparts. The legislation in Congress is being proposed by U.S. Rep. Mike Quigley, whose Illinois district is home to the highest concentration of recent Polish immigrants in the country; he has fought for this legislation since he took office three years ago, as did his predecessor, Mayor Rahm Emanuel. Newly elected Sen. Mark Kirk of Illinois has taken up the cause in the U.S. Senate. The argument that the visa requirement should be based on the refusal rate because too many Poles want to come to the United States and overstay their visas is a specious one, as far as I and many other Polish Americans are concerned. It has become something of a Catch 22. “You can’t come without a visa, but we won’t give you a visa because we know ahead of time that you’ll overstay it.” What good is a visa requirement anyway if it is not enforced? The idea behind requiring a visa is that authorities know how many people are in the U.S., where they are living, and when they are due to return to their country. I rushed out to see the Chicago premiere last year of the documentary film Tony and Janina’s American Wedding the minute I found out that parts of it were filmed in Nowe Miasto Lubawskie, the Polish town where I lived in 2000 while writing my book A Polish Son in the Motherland. After the screening, I talked with Tony Wasilewski about his family’s predicement–his wife was deported for what really amounts to a paperwork error, and their attempts to build a business and a life in the U.S.–perfectly legally–have been destroyed and immigration law has torn their family apart. In a telephone conversation May 28 with Janina Wasilewski in Nowe Miasto, I listened while a rather depressed deportee explained that she still had hope that her deportation would be reversed, but she said little had changed over the past year. Ruth Leitman, writer-producer-director of the film, and Steve Dixon, coproducer, told me that there is a new motion to try to get her back to the U.S., and they have letters from Rep. Luis Gutierrez supporting the new motion, as well as a letter from United Action Connecticut. “I have hope but I am not sure if anything will happen,” Janina told me. “Two waivers were denied, but I hope the motion maybe will be successful.” She said her husband continues to work with their attorney in Chicago. “I have hope,” was all she could say. 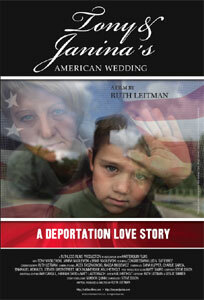 Everybody who has seen the film was most alarmed by the way the deportation has affected the couple’s young son. I asked Janina how he was adjusting. “He is okay,” she said, rather dubiously, “but he is without his father so he is sometimes scared. Yesterday Obama was here and he didn’t want to watch it because he does not want to think that it is always about us.” She said her son was doing well in school and keeping his English with the help of a tutor, all in the hope that the family will be reunited one day in the American life they built for themselves before she was forced to leave. Thank you for writing me. I have heard from many Americans concerned about immigration, and I value your input as we work to address this pressing challenge. We are all united under the principles etched into our Statue of Liberty: “Give me your tired, your poor, your huddled masses yearning to breathe free.” Our nation has always prospered from this generous and hopeful spirit. Yet, today, our immigration system is broken and a large portion of our economy depends on millions of workers living in the shadows. We are a Nation of laws and a Nation of immigrants, and we must reconcile those traditions. For too logn, politicians in Washington have exploited this issue to divide us rather than searching for practical solutions that unite us. We must put politics aside and offer a comprehensive solution that secures our borders, enforces our laws, and reaffirms our rich tradition of welcoming new immigrants. There is broad consensus around building a solution that stops the flow of undocumented workers across our borders and prevents employer from hiring undocumented workers. However, we know that enforcement is only part of the solution. We must also require undocumented immigrants who are already here to step out of the shadows and onto a responsible path to earn citizenship by demonstrating sound character, a commitment to America, and a strong work ethic. To learn more about my policies on immigration, please join me at www.WhiteHouse.gov/agenda/immigration. For Additional information and resources, visit www.dhs.gov or call 1-800-375-5283. The irony is that lifting the visa requirement at this late stage will be a symbolic gesture, rather than an economic incentive. The fact is that Poles who have rushed to Chicago and other U.S. destinations for work–or for bread, as Poles have said for more than a century–have in recent years found it easier as members of the European Union to work in Ireland, Norway, Denmark, Italy, and even France than in the U.S., where xenophobia and the economic crisis have demonized immigrants. The U.S. Visa Waiver program will not save Tony and Janina Wasilewski from their cruel predicament; only a humane and rational approach to overall immigration reform will accomplish that. Tags: Barack Obama, immigration reform, visa for Polish citizens coming to the U.S. This entry was posted on Sunday, May 29th, 2011 at 3:43 pm	in Current Issues, Recommended, Videos. Thanks for writing this beautiful piece as well as the letter to our President. I wanted to let you & your readers know that we have launched a campaign to draw media attention to the Wasilweski’s family story to push to have them reunited by July 4th. Tony & I were featured on MSNBC this week. Please join our website and spread the word about this family. You must have read my father’s anguish about his sons waiting for a visa-2 have died already and the old man in his 80’s is still hopeful that one day the only son who has been waiting for 20 years now will be granted a visa. It is a painful reality, a waiting game but rather than jump the boarders, we prefer to wait. I am impressed with your letter to the president and the response.